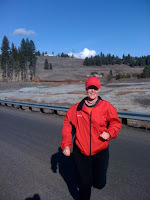 Warrior Marathon Runner: Running in the Sunshine! Oh my gosh, it is close to 60 degrees here in Spokane this weekend. Ran some awesome long runs getting ready for the new Rock N Roll Dallas Half Marathon next weekend. Got some new Saucony apparel to show off next weekend in the big D! Everyone get out there and move!